This quilt belongs to Judy, one of my new customers, let me tell you about the quilt and little bit about her. First off when Judy made this quilt her Mother’s health was stable, and as the weeks have passed her Mom was hospitalized for a time and now is resting at home with the medical professionals telling the family her life may be nearing the end. I have been following them on Facebook and Judy is remembering the quilts she has made for her Mom which are now blanketing her in love at home. Judy also talks about a Swedish Rye Bread her Mom made at Christmas time and that they made it when she came home, reminding them of good times. Please say a little prayer for our quilting sister, Judy and her family. Judy’s Mom taught her to sew when she was 9, and she has made over 40 quilts and has kept about 10 of them for herself. 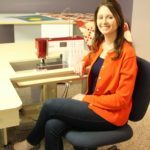 Judy enjoys quilting because she loves how a quilt feels, the creative process involved, and to give them as gifts. 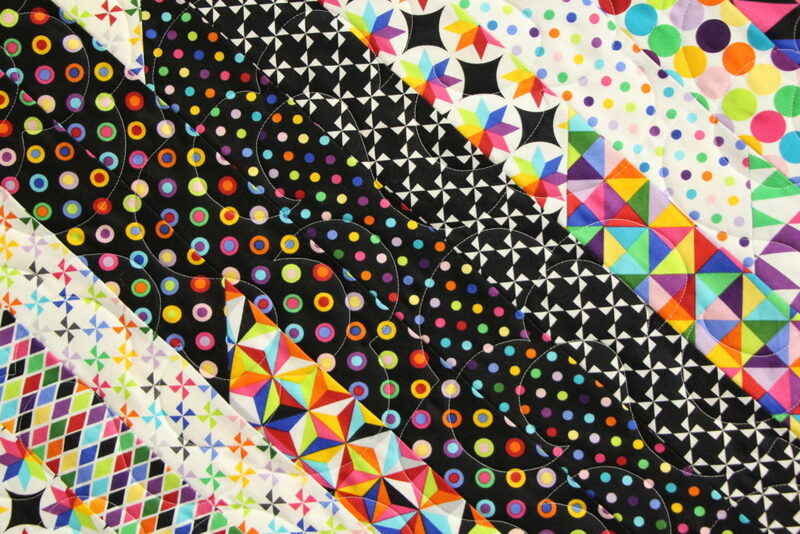 Making quilts has also gotten her through some difficult years, “It is good therapy to make a quilt”, I think we all can agree with her on that! She currently lives in South Carolina, but has lived most of her life in the midwest, being born and raised in Iowa. 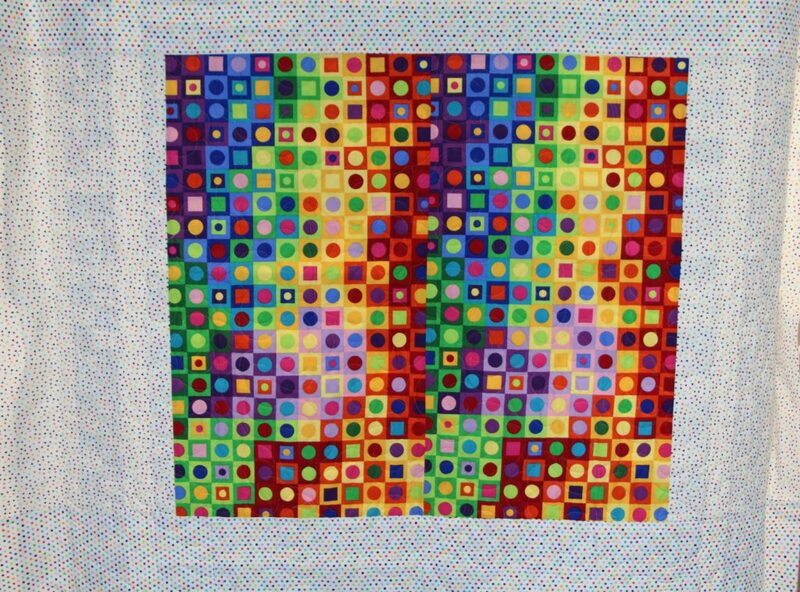 Judy learned to quilt while living in Singapore for a few years around 2000. The class she took was taught by an australian and they hand pieced that quilt. The fabric for this quilt Judy bought because of the bright colors and she thinks her 3 grandchildren, who are all under 2 1/2 years old, will enjoy it when they come to visit. It is from Color Works Concepts by Northcott. Notice the pieced border, this is something new she wanted to try. In the instructions she sent me she tells me the borders are a bit “wonky-sorry”. I have to say, these borders are awesome! 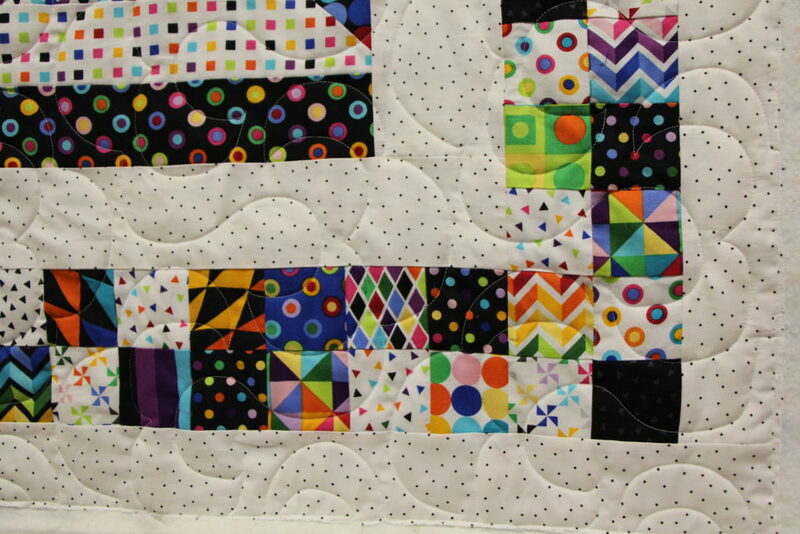 Her piecing was very accurate, the border laid flat and was easy to quilt. I asked her about the pattern and she said it is a jelly roll quilt. She would recommend this for a quick method of putting a quilt top together. I’m with her, don’t we all need a quick quilt from time to time. 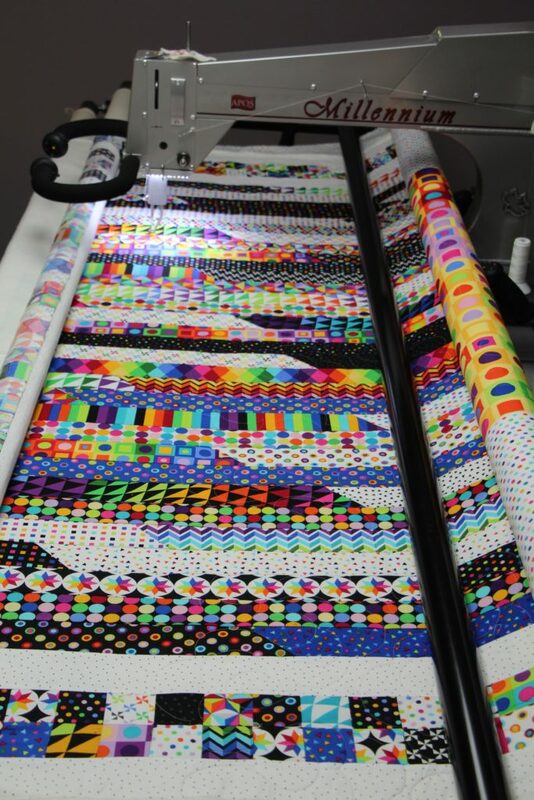 Judy choose the quilting pantograph, Fluffy with white thread. It is a simple open design and I think it complements the quilt. Here is the back of the quilt, isn’t this great! I can imagine her little grandchildren will have fun playing on either side of it. This is the finished quilt measuring 68 x 89. Judy, I am glad you went out of your comfort zone and tried something new and that you are keeping this one for yourself. 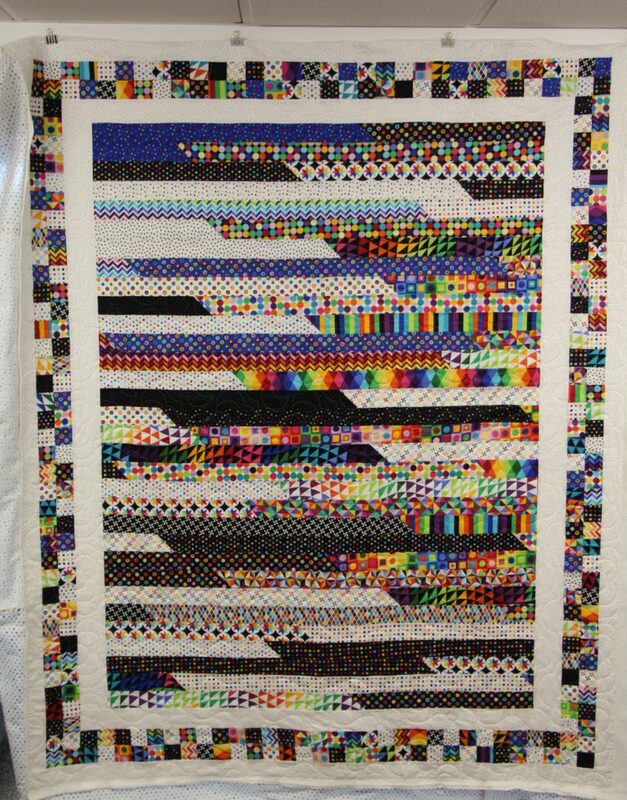 It is a wonderful quilt and will brighten your day. This entry was posted in Uncategorized on July 24, 2017 by Carla. Thank you for your kind words. I read the first paragraph to my family. I’m so happy the borders turned out good! I’ve been working on the binding here at my sister’s while we attend to Mom. You are welcome. I am glad you can be with your Mom, prayers to you and your family. Wow. The colors are fun and bright! !